We specialize in all types of floor finishes; from marble to CVT strip 'n' wax tiles, to complete concrete sealing and staining. We take great pride in making sure your commercial flooring will look its best at all times. Properly maintaining your floors will get you long years of wear and tear out of them. Keeping your floors clean is a great way to show your customers and employees that you are serious about your business image and your visitors' health. By having your floors proprerly maintained, it will eliminate dust build up, dirt and grime which can cause your floor to dull and leaving it looking quite ugly. 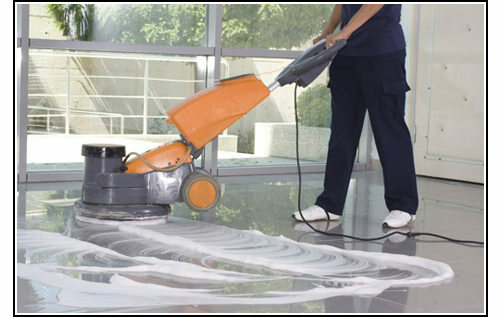 At Connah Cleaning Services, we do it all when it comes to commercial floor care. 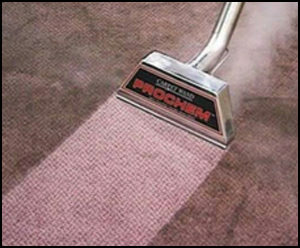 We pre-vacuum all carpet areas. Extra attention is taken to any stains and pre-treatment / pre-spray is applied separately (not mixed with water so no residue is left behind). Next is a pre-buff to agitate deep down soiling using a 17" bonnet pad scrub machine. Then we use a very hot water extraction system to flush out all the deep down soiling and any soapy residue that may have been left in the carpets from previous cleaners. We remove dirt, stains and bacteria on any floor surfaces, as well as embedded polymers and waxes. The main purpose in keeping regular maintenance on these types of floor is for long lasting life and appearance, without having to do an expensive restore process in the future. For instance, in main traffic areas, vinyl tiles should be stripped, sealed and waxed every 6 months, with a minimum of 3 coats of wax each job, and a regular daily dry and damp mopping using a high quality residue-free neutral floor cleaner. We can provide your marble or stone floors with the shine you desire, enhancing the finish in the marble and protecting the stone marble from the wear and tear of high traffic use and spills. 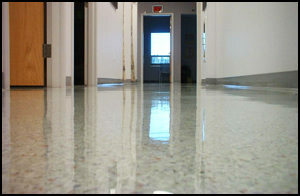 We wax and buff vinyl and linoleum floors to maintain their long lasting appearance. And in the long run, with regular maintance, saving you money from replacement cost. We remove coatings that inhibit the stone ability to breath, thus preventing stones from cracking and popping. Our high quality work standards will set your work place apart from the others... guaranteed. Please call today to find out what we can do for you. 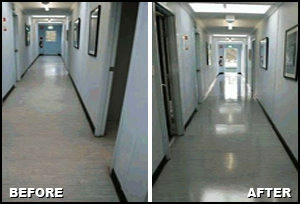 We can plan and organize a floor maintanance program that will suit your needs and budget.